Producer for people such as Murs, 2Mex (Mindclouders) and LMNO. Album's worth of good music featuring the above emcees as well as members of Blak Forest, Jizzm and much more.. 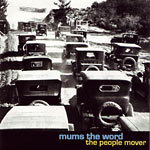 Produced by Mums the Word.